Thank you for visiting the web site of LDH Landing Nets. I have been crafting these premium quality nets since 1983. Attention to detail on them is second to none and if you appreciate fine craftsmanship, you will not be disappointed. LDH Landing Nets offers a net for virtually any situation that discriminating anglers find themselves in. The focal point of each net is the handle, which is always a piece of highly figured North American hardwood. You may choose from many different woods ranging in shades from the cream colored maples, including birdseye, curly and quilted figure; the reddish colored cherry, redwood and red phase maple burl; the classic feather crotch, curly or marbled walnut to the wildly spectacular burls including black ash, white ash, maple, birch, cedar and walnut among others. Most of the woods mentioned are generally in stock, however since I will use only the finest examples of each, they are subject to their availability. Bear in mind when viewing the photos of the nets that I don't use any stains or coloring agents of any type on them. What you see is the natural coloration of the wood. The hoop on each net is a three ply lamination of woods complimentary to the color of the handle. Each net is signed with the makers initials and the year of manufacture on the inside of the hoop. Ordering a net from the 'Work in Progress' sections allows for the addition of the owners name at no extra charge. 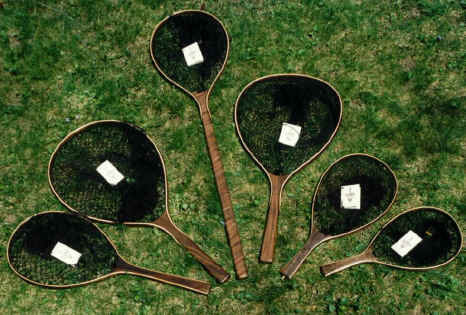 From left to right - Float Tube Net, Steelhead, Canoe, Brule Steelhead, Wading Net, Brook Trout Net. Not pictured are the Nipigon and the Guide Nets. The LDH family of landing nets now consists of 8 different sized nets made from any of more than a dozen different types of wood. All nets pictured above have walnut handles with walnut/maple/walnut hoop laminations. The About page shows examples of some of the spectacular pieces of figured wood that I utilize in the manufacture of my nets. 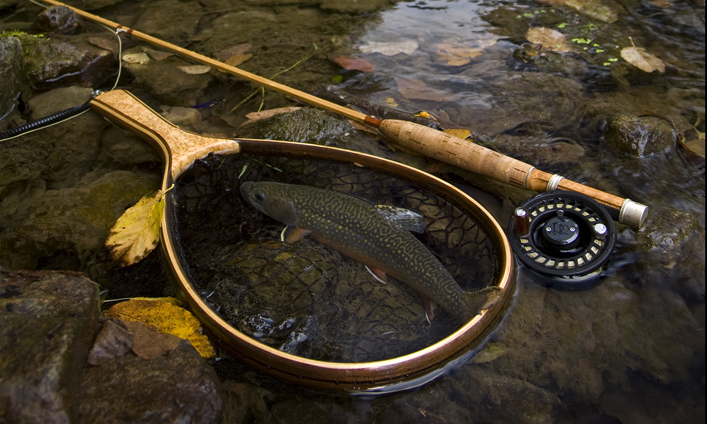 Brook Trout Net 18.5" 8.25" 11.25"
Wading Net 21" 9.25" 13.25"
Nipigon Net 22.75" 10.25" 14.75"
Float Tube Net 28" 10.25" 14.75"
Brule Steelhead Net 29.5" 14.5" 17.25"
Steelhead Net 32.5" 14.5" 19.5"
Canoe Net 48" 11.5" 17"
Guide Net 50" 14.5" 19.5"